Matthew will perform these amazing and original pieces, and then break it all down for you in precise detail. They are a combination of clever apparatus, new technique, and hilarious presentation. Matthew will also spend time talking about character creation, the "super-hero theory" as well as rehearsal techniques including the naked rehearsal, which should be interesting. 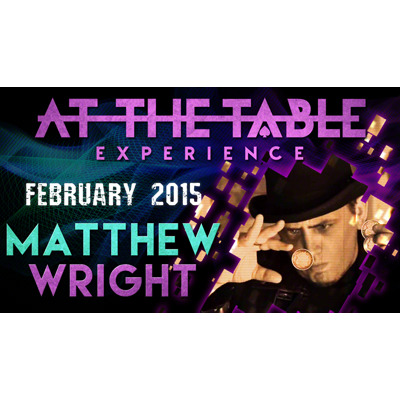 Wright will also perform and explain a piece from his 2nd place FISM act that has never been taught before, until now. And it involves 50 sponge balls! Initially I thought that I had not heard of Matthew Wright or his magic. The first part was true but definitely not the last part. Matthew has created many popular effects and I enjoyed watching his magic. His methods and gimmicks were not suitable for my performance style and I do not find his performance character to be appealing in the least. His accolades in the magic community more than qualify him as a proficient practitioner of this craft even if he doesn’t suit my tastes most the time. Horizon: The first effect he goes over is his Horizon levitation system. This has been released by Murphy’s and is a very cool slow motion levitation of a card, box or a coin. He teaches a highly gimmicked three fly here as well as a levitating card and a levitating card box. The gimmick and preparation for this effect is heavy. The coins cannot be handed out and you are left very dirty with the cards as well. The overall effect is very powerful but the sacrifices that you have to make to get into position, let alone that you probably will need to purchase the gimmicks from Murphy’s, it is not worth it to me. Nested Boxes: This is a new product of Matthew's where the card box continually replicates itself. This was a fun bit of magic that I could see working really well on stage for a manipulator but Matthew proves that it works well for close up as well. Once again, you really need to purchase this product in order to perform it. Think-A-Card: This is a tough think a card effect where a card is chosen and you are able to magically produce that card. This is completely impromptu card trick, it will take some real world practice but it leads to a very powerful effect. With some similarities to Vernon’s Trick that Cannot be Explained this is not a trick for the feint of heart. Phoenix Aces: This is Matthew's take on the classic. I actually prefer Matthew’s version to Pop Hadyn’s original. It is a fast visual production of four cards. It really looks very fair and is very startling. Ripper: This is an awesome torn and restored card and was probably my favorite effect from the lecture. A spectator signs the front and back of a playing card, it is torn turned around and restored in a mismade fashion. This mismade restoration is not mandatory but it does give the effect a nice surprising ending. If you would like to do the mismade ending once again you will need to purchase the gimmicks in addition to this lecture. There is a gimmick you will need to make either way and it isn’t incredibly difficult to construct. If you don’t get it signed then you don’t need to purchase refills. This is a great piece of mental magic, a card is placed on the table with a bill. A random card is named and it ends up written on the bill.This is an awesome piece of magic but it relies on a couple methods that he really doesn’t teach. He explains how the trick works and points you where to go for more information but you really don’t get enough information to actually perform the effect. Twin Peaks: Matthew shares a handful of different ideas that you can use with his product the Four Seen Wallet. He shows you how to predict multiple selected cards and get a lot of mileage. The basic mechanics of the wallet are available by a few different dealers online, if you would like to see what it is capable of then you do not need to watch this lecture. Check it out online and make your decision there. It is a very versatile wallet for sure. Nut Dropper: A borrowed ring vanishes from inside a box held by a spectator and apears inside of a nut inside of an orange. This feels like the classic bird in egg in lemon in orange effect. Matthew has really made this very practical and fairly easy to do. The gimmicks and setup are very involved here as you might expect but this could easily be used to close a show. You do need to purchase the gimmicks from Matthew. Bubble Gum: As part of his FISM act Wright blows a big bubble gum bubble and pops it producing up to 50 sponge balls. I didn’t really understand this as an effect. I think that this hits a very specific niche as far as magicians go. If you want to produce a whole bunch of sponge balls from a bubble gum bubble than this is how to do it. I don’t care for it though. LSD: A thought of card appears in a listerine strip container. Once again this trick is highly derivative. You need to purchase John Kennedy’s Mind Power Deck to perform it. It is basically a refurbishment of Smoke by Derren Brown. The trick is excellent. I have to say that this was one of my least favorite lectures to date. A lot was taught but most of it requires expensive props and outside purchases to perform. The magic was powerful but you really don’t need to watch this lecture to learn it.